Per reader request, today I'm tackling Pete's Dragon, that wonderful Disney tale of black-market-child-selling, gratuitous corporal punishment of students, sadistic quack doctors, and hilarious alcoholism. Also, there's a dragon. The adults all believe that Pete's dragon, Elliott, is imaginary--well, all except for the town drunk, Mickey Rooney, but who listens to an alkie, am I right? Remember how, on Sesame Street, Mr. Snuffleupagus initially used to be treated as Big Bird's imaginary friend, but then he materialized as "real"? Apparently the idea behind this was that it could be damaging to children to think that adults wouldn't believe what they said-- especially since kids need to feel like they would be taken seriously if they confided in an adult about something like child abuse. Pete's Dragon has no such compunction. Pete is abused, repeatedly and in numerous ways, by pretty much every adult he encounters. He was even "sold" to a cruel hillbilly family for $50 as a child slave. The only friend he has in the world is the invisible dragon Elliott, and now a charlatan doctor is trying to capture the dragon to use his body parts for medicine. After much peril and trauma, Pete finally finds a loving family and things start looking up for him. So, of course, Elliott abandons him, vowing Pete will never see him again. Perhaps he was pals with Puff and this is revenge for his callous treatment at the hands of Jackie Paper? Pete's Dragon. Dir. John Chaffey. Perf. Helen Reddy, Jim Dale, Mickey Rooney. Disney, 1977. Watch the trailer on YouTube here. 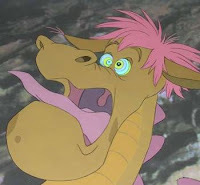 Yay, Pete's Dragon! Disney has given us the gift of so many scarring movies. I'm revisiting the wonderfully twisted, disturbing, and scarring-for-a-lifetime material specifically intended for children. Uncle Arthur's Bedtime Stories: "Jesus Understood"
Uncle Arthur's Bedtime Stories: "The Two Carolines"
Uncle Arthur's Bedtime Stories: "The Hollow Pie"
This site does not condone the banning or censorship of any material. Read on!. Powered by Blogger.